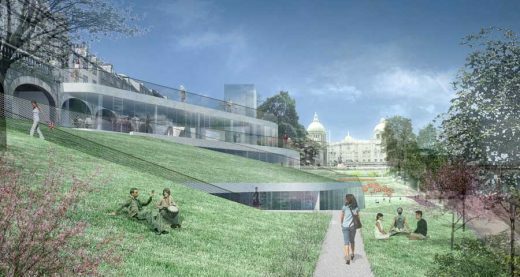 The controversial Brisac Gonzalez-designed gallery scheme for Union Terrace Gardens in Aberdeen – abandoned in 2010 to be replaced by the even more controversial ‘Granite Web’ by Diller Scofidio + Renfro – appears to be back on the cards. Indeed why not? This was the initial plan and a fairly sensitive approach to this key urban location. Like so many major urban developments – for example Glasgow’s George Square or London’s Battersea Power Station – there are lots of designs and design teams and then when all seems lost for one set suddenly the music stops and the prize once again lands in a new set of hands. According the BBC Scotland, Aberdeen City Council deputy leader Marie Boulton said the proposals backed by Peacock Visual Arts could be back on the table ‘in some shape or form’. Proposal by Brisac Gonzalez seems to be fading as international competition launched. The City Council have received hundreds of emails from concerned citizens who want to ensure that the consultation process is unbiased, open-minded and that, therefore, it includes Peacock Visual Arts. Whilst we understand that the consultation has been commissioned by ACSEF who are supporting Sir Ian’s square plans, we believe that – as it is being paid for with public money – the process must be transparent and that therefore people must get the chance to show their support for alternative uses of the Gardens including Peacock’s new Arts Centre, which has had over £1million of public money invested in it to date. Peacock’s new arts centre has full planning permission, is fully costed and has secured 75% of its funding. It was ready to break ground in 2009 with doors opening to the public in 2011. Peacock’s development was designed to follow the natural contours of the gardens and retain the green space. As Sir Ian’s vision involves filling in the Gardens in their entirety, there is no place for Peacock’s original scheme in his plan. In spite of this the Scottish Arts Council agreed with the City to ring-fence Peacock’s money for 12 months to allow the viability of Sir Ian’s vision to be investigated. This deadline is now fast approaching and the danger is if the Peacock scheme is sacrificed whilst Sir Ian’s is still being evaluated, the people of Aberdeen could end up with nothing. We remain hopeful that a sensible option might still be pursued; one that uses Peacock’s money and planning permission to deliver a new arts centre as the first phase of a wider redevelopment of the Denburn Valley. However, we are now in an extremely vulnerable position as the City Square scheme necessitates the abandonment of our plans, the loss of our funding and of Peacock being made homeless after 35 years. Peacock Visual Arts and their partners at Aberdeen City Council have secured over £9.5m to deliver a new international cultural centre for Aberdeen in Union Terrace Gardens. This stunning new building, designed by world-class architects Brisac Gonzalez, has full planning permission, 75% of its funding in place and will deliver significant economic, social and tourism benefits for the North-east, putting Aberdeen on the international cultural map. This is now in jeopardy following Sir Ian Wood’s announcement last November of his idea to fill in Union Terrace Gardens to create a new civic square and underground real estate. He is offering £50m towards the total cost of this on condition that at least £50m of public funds is also committed to it. His scheme involves concreting over Union Terrace Gardens, a mature green space and municipal park. This will involve felling around 100 trees and the loss of Peacock’s new public arts centre. What’s happening now? Aberdeen City Council has empowered ACSEF (Aberdeen City and Shire Economic Future), who are supporters of Sir Ian’s scheme to run the public consultation process that will decide the fate of the Gardens. This will be launched on January 11th. Peacock Visual Arts believes that this consultation must be objective and explore the full range of potential options for the Gardens without preordained outcomes. However, it has been confirmed that the people are only going to be asked what they want to be in Sir Ian Wood’s scheme, rather than having a broader and more fundamental debate on the future of their city centre. The public consultation MUST offer the people of Aberdeen a genuine opportunity to say whether they actually want a development that will cover up their Gardens forever. The citizens of Aberdeen have the right to have this debate. Meanwhile Peacock’s funding is time-limited and project specific. The largest part of our funding package, an offer of £4.3 million from the Scottish Arts Council, runs out in March. If this deadline passes without a decision we will be forced to abandon our plans for the Gardens and will be unable to pay for a new home when our lease runs out in two years time. Sir Ian’s scheme therefore not only destroys a mature green space, public park and the unique topography of the city but also necessitates the abandonment of the new arts centre and the loss of the funding attached to it. If this goes ahead Aberdeen will lose a beautiful piece of its environmental heritage and a vital part of its cultural future. What about a compromise solution? We have approached ACSEF and suggested a phased approach to the regeneration of the area which could include partial decking over the dual carriageway and railway whilst retaining the Gardens and the Peacock building as designed. This inclusive compromise could, we believe, give the city a win-win. It would deliver all the benefits of Sir Ian’s idea while respecting the topography and ecology of the site and not waste the £1m+ of public money already invested in the Peacock project. ACSEF have not been willing to consider this option. Northeast Scotland’s main centre of contemporary visual arts under threat not by credit crunch but by North Sea oil millionaire Sir Ian Wood’s plans to flatten Union Terrace Gardens. Brisac Gonzalez’s design brought welcome contemporary architecture to Aberdeen. Plans to raise the sunken gardens to street level have abounded for decades. But Ian Wood pledged up to £50 million of his own cash to be matched by public funding. A feasibility study commissioned by Scottish Enterprise is to be finlaised by March 2009.